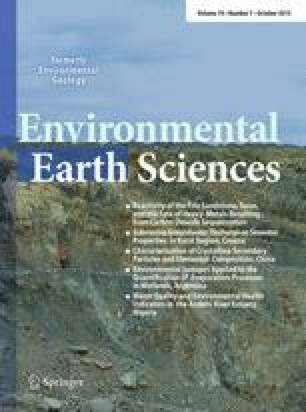 Uptake and cycling of nitrogen (N) in the littoral zone of a lake-receiving nutrient-rich mine water located in Boliden, northern Sweden, was investigated. Stable isotope tracer solutions of 15N as NH4 + (NAM mesocosm) or NO3 − (NOX mesocosm) were added to mesocosms enclosing plants of common reed (Phragmites australis). The 15N abundance in various plant parts was measured at pre-defined time intervals over an experimental period of 22 days. During the course of the experiment, plant parts from the NAM mesocosms were significantly more enriched in 15N than plant parts from the NOX mesocosms. On day 13, Δδ15N values of the fine roots from the NAM mesocosms had reached +8220 ‰, while the maximum Δδ15N value in NOX roots was considerably lower at +4430 ‰. Using 15N values in macrophyte tissues present at the end of the experiment enabled calculations of uptake rates and % of tracer N recovered in the plant (%tracerNrecov). Maximum tracer uptake rates were higher for the NAM mesocosms (1.4 µg g−1 min−1 or 48 mg N m−2 d−1) compared to the NOX mesocosms (0.23 µg g−1 min−1 or 8.5 mg N m−2 d−1). Calculations of %tracerNrecov indicated that 1–8 and 25–44 % of added N was assimilated by plants in the NOX and NAM mesocosms, respectively. Hence, P. australis was more effective in assimilating NH4 +, and a larger portion of the tracer N accumulated in the roots compared to the other plant parts. Consequently, macrophyte N removal is most effective for cold-climate aquatic systems receiving mine water dominated by NH4 +. For permanent removal of N, the whole plant (including the roots) should be harvested. The study was supported by grants from the Swedish Governmental Agency for Innovation Systems (VINNOVA) to B. Öhlander (Grant No. 2007-01680) and the mining companies LKAB, Boliden Mineral AB, the Adolf H. Lundin Charitable Foundation, and J Gust Richert Foundation. We wish to thank Milan Vnuk for final drawing of the figures. We also wish to thank Skellefteå Kommun for permission to use the bathymetric map of Lake Bruträsket. This is a CAMM (Centre of Advanced Mining and Metallurgy) publication.